Throughout the summer, my colleague Pat Reilly has been performing a deep dive into the intricacies of fixed income attribution across asset types. Now, he's invited me to guest star on his Summer of Attribution series! So let’s round out our series with multi-asset attribution. We’ve looked at various attribution models for core fixed income strategies and liability-driven investing, but we’ll now close out the summer with attribution for balanced portfolios, where new decisions come into play. Multi-asset strategies tend to be managed as a combination of top-down and bottom-up decisions, where asset allocation teams determine the optimal asset class mix and individual teams run the fundamental analysis to construct sleeves within the asset classes. However, there are also approaches to multi-asset investing that consider all asset classes holistically when constructing the portfolio. We even see strategies, such as event-driven, that use multi-asset investing to exploit company-specific bets rather than tactical asset allocation plays. Depending on where the strategy lies on the spectrum, there are a couple of attribution models that may fit the bill to quantify the portfolio management decisions. Let’s review the decision-making process for traditional multi-asset portfolios that are constructed by bringing together individual asset class sleeves. Typically, portfolio management in the multi-asset world starts with a strategic or tactical asset allocation decision relative to a mandated benchmark allocation. From there, individual asset class teams, likely separate from the asset allocation teams, are tasked with specific mandates within the asset class. This multi-step process for multi-asset portfolio management can be captured from the perspective of an attribution framework in Figure 1. When the management of the portfolio does not explicitly incorporate asset allocation decisions, a risk-based performance attribution (RBPA) model can help quantify multi-asset portfolio management using pure systematic market factors, as defined by a risk model. 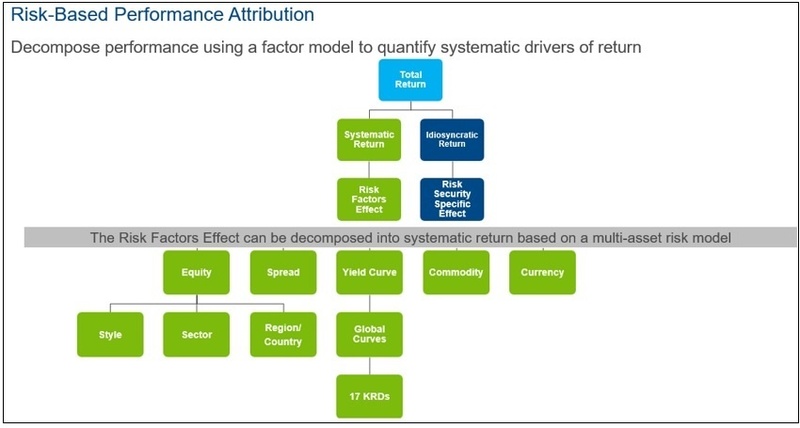 Here, we break down performance into systematic risk model factor effects and idiosyncratic effects. 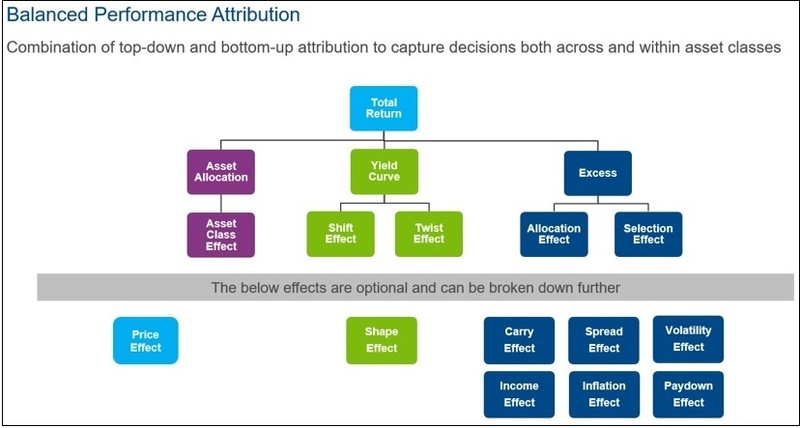 Like the balanced attribution model, the RBPA model will apply relevant effects to the proper asset classes based on the exposures to the systematic risk model factors. At a high level, the risk model factors break down into Equity, Spread, Yield Curve, Commodity, and Currency factors and each factor group can be decomposed further into more granular effects. For equities, these more granular factors encompass fundamental styles (i.e. value, growth, momentum, etc. ), sectors, and countries; for fixed income, these factors break down into DTS- and duration-based factors and global curve factors; commodities can also be explicitly captured within this model using a set of momentum and market driver factors relevant in the commodity markets. Evaluating multi-asset portfolio performance through the lens of a risk model creates a direct link between the risk management process for understanding portfolio volatility and the attribution process for understanding realized portfolio performance. 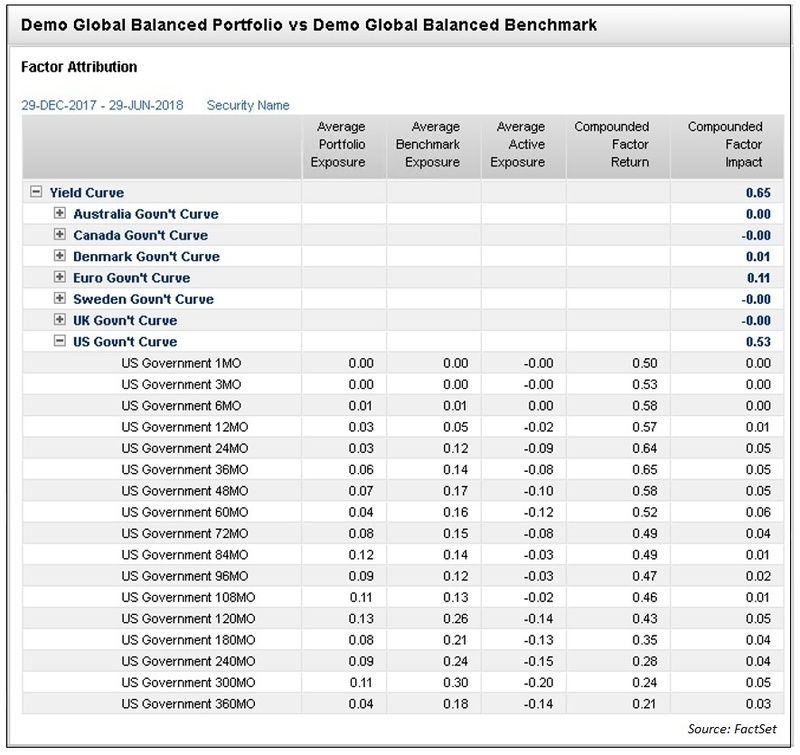 Using a global balanced portfolio compared to a global balanced benchmark, we can see how the two attribution models tell a story around the management and performance of this portfolio. There will be areas of overlap but also areas where each model provides unique insights. Beginning with the balanced attribution framework shown in Figure 3, we can see that the portfolio underperformed the benchmark by 184 bps. Luckily, the asset allocation choices are mostly off the hook here. The Asset Class Allocation Effect shows asset allocation decisions as an almost negligible driver of the underperformance. Looking at the equities in the portfolio, the attribution model highlights a poor skill in equity sector allocation, with this portfolio losing -1.44% from Group (sector) Allocation Effect. Overweights in Telecommunication Services, Financials, and Consumer Staples, which were underperforming sectors, resulted in large drags on performance (-0.38%, -0.14%, and -0.11%, respectively). 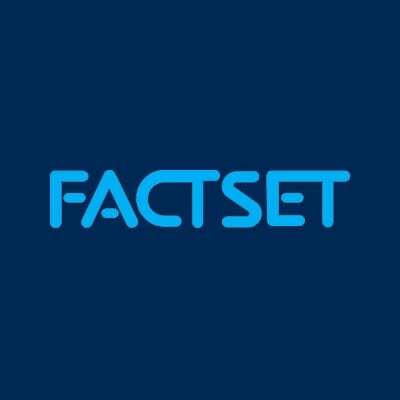 An underweight in Information Technology, which was an outperforming sector, also resulted in -0.23% of underperformance. Within equities, the Selection Effect shows that stock picking was only a marginal help to performance and while currency bets fared better than the sector bets, the Currency Effect shows that currency management within equities remains a negative contributor to performance. Fixed income weathered the storm relatively well compared to the equities. Curve management can be credited with 0.59% of outperformance, as shown by the combination of the Shift and Twist Effects. Unfortunately, after accounting for curve positioning, the fixed income story turns for the worst, with currency management as the main culprit with -0.60% coming from the Currency Effect. Turning to the RBPA framework, we see again the underperformance of 184 bps, but instead of starting with quantifying an asset allocation decision, we instead break the active performance into the portion driven by systematic risk factor bets and the portion driven by security-specific impacts. The Risk Factors Effect shows -0.70% of underperformance coming from our systematic factor bets. 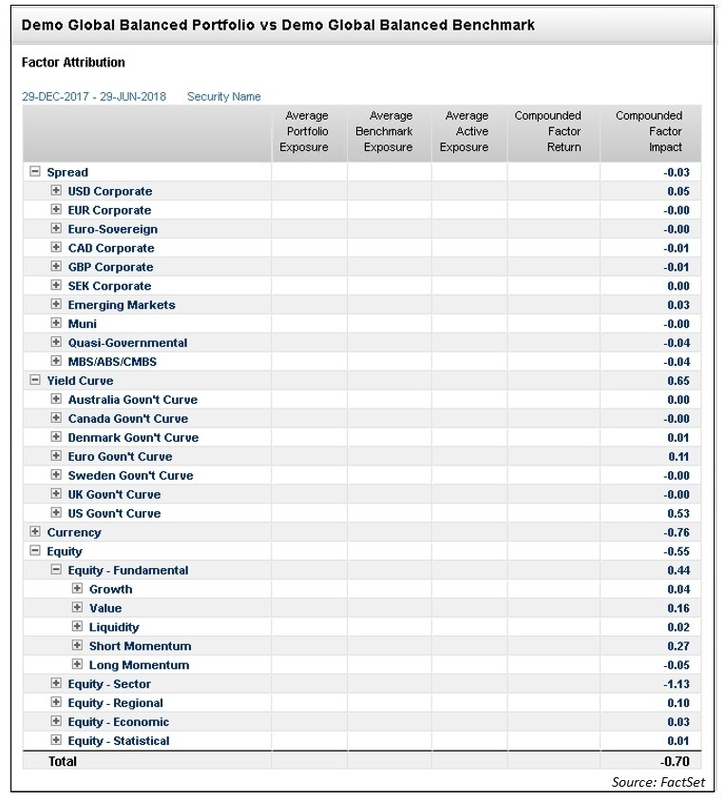 A breakdown of those factor bets (shown as “Compounded Factor Impact”) shows that Equity and Currency bets detracted from performance to the tune of -0.55% and -0.76%, respectively. Similar to the balanced attribution model, curve management was a silver lining for us. 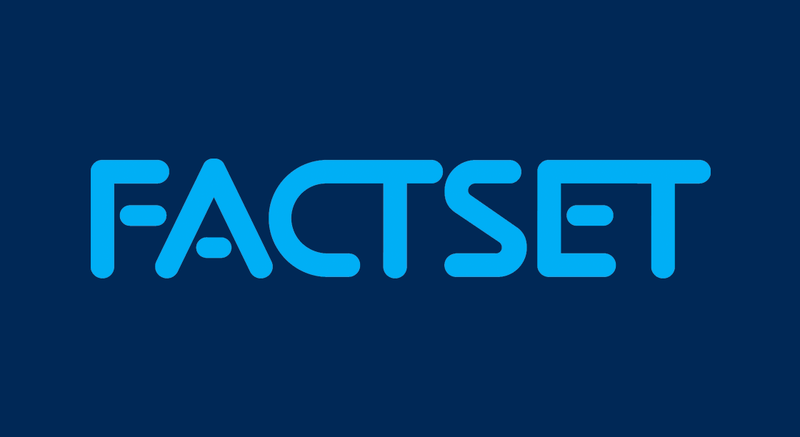 However, converse to what the balanced attribution model told us, the choice of individual securities was the largest drag on performance, with -1.08% coming from the Security Selection Effect. A granular breakdown of the Risk Factors Effect, as shown in Figure 5, shows additional insights that the RBPA model affords. Figure 5 again shows the -0.55% of underperformance from Equity factors, and in line with the balanced attribution results, we see poor skill coming from allocation to the systematic sector factors (-1.13% in this case). However, we’re also able to see that the portfolio benefited from fundamental style factor bets as well as the regional allocations (0.44% and 0.10%, respectively). The last two insights are lost within the balanced attribution framework, which would be major shortcomings of the model for a portfolio whose equity mandate aims to create value-add through these types of factors. Figure 6 highlights an additional advantage to the RBPA model, which is the granularity around yield curve positioning. Here, we dive deeper into the 65 bps of outperformance from the curve factors to see which curves and even how our positioning along each curve contributed to performance. Which Model Is Right For My Multi-Asset Portfolio? The differences in the results of the two attribution frameworks described above may lead you to ask, which is the right attribution model for my portfolio? The great news about the two models that I’ve described is that they are not mutually exclusive and can be used very nicely as complements to one another depending on the mandate of the multi-asset portfolio and the manager’s (or managers’, as is often the case with multi-asset) skills.